These days, there's a Whole Foods on New York's Bowery, but 50 years ago, it was skid row. 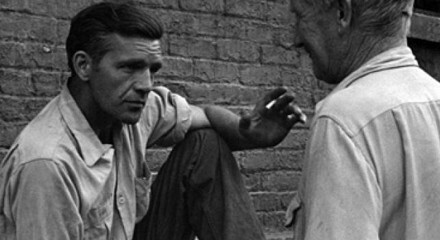 Lionel Rogosin's 1957 quasi-documentary On the Bowery follows three days in the lives of a group of homeless alcoholics. Shown with In the Street, a short by writer James Agee, photographer Helen Levitt, and director Janice Loeb. See it all at the Gene Siskel Film Center. Yasmin Nair recommends checking out "Strange Bedfellows," a collection of artwork by queer artists currently on display at Columbia College's Averill and Bernard Leviton A+D Gallery. The Museum of Contemporary Art hosts "Stress/De-Stress," a three-projector film screening featuring works selected from the Chicago Film Archives by Christy LeMaster, accompanied by live readings from Mairead Case and Ed Crouse, and music by Joshua Dumas.